Gerald is careful. Piggie is not. Piggie cannot help smiling. 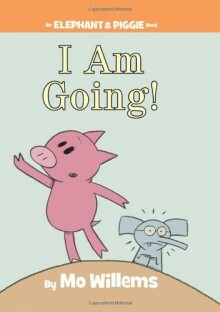 Gerald can.Gerald and Piggie are best friends.In I Am Going!, Piggie ruins a perfectly good day by telling Gerald she is going. If Piggie goes, who will Gerald skip with, play Ping-Pong with, and wear silly hats with?Willems's Geisel Award–winning duo continues to delight readers with their silly shenanigans. Packed full of humor and heart, the Elephant & Piggie Books are vetted by an early-learning specialist and early learners themselves, so they'll be right on target for new readers. Hm. My niece, nephew, and I found this to be a bit bland for an Elephant and Piggie book.